Super Hero Boy: Arg I'm not sure April is so Enchanted. Arg I'm not sure April is so Enchanted. Don't get me wrong, I actually really love British dramas but I had my doubts about Enchanted April. Mostly because its taken what seems like a lifetime for it come out on dvd not to mention its won more awards than seems humanly possible. That all just seems too much pressure in a review as what happens if I hate it? Enchanted April follows a group of British women who need an escape from their boring lives and husbands who are totally checked out. They go on a vacation in the countryside as an escape. The women are all pretty different and do not at all get along. The scenery is beautiful and it certainly makes me wish for a European vacation myself. I could not at all get into the story line. The movie is stuffy, the women are not at all appealing to me at all, and the story is so slow building that I could feel my hair growing. Enchanted April certainly has a lot of substance and the characters are well developed. Fans of British drama will absolutely love it, it was just not at all to my taste. I do know there were a ton of people anxiously awaiting its release. So if your one of those people I'm excited to tell you I have a copy of Enchanted April to give away to one of my readers. 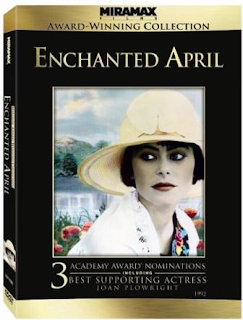 As well Enchanted April is available right now on dvd and you can pick up your copy on Amazon! Leave a comment on this post. Check out Enchanted April and let me know why you'd like to see the movie! I like British movies and this sounds interesting! Seriously? I was totally into this movie when it came out but that was a loooong time ago. And I was obsessed with all things English when I was in high school. I'm curious what I would think of it now. This looks like an interesting DVD that I'd like to watch. Please enter me in your giveaway. I like to see this movie because I like the way the English talk. After reading your review, I'd like to see this movie just out of curiosity! This movie is excellent and you know you cannot go wrong with joan plowright..I would love to own a copy! This sounds like it would be a great escapist movie - even if you did not really like it. I'd love to see this movie because I'm a teacher who is home for the summer and I want to just veg in front of the tv all summer! My husband is English and I would love to see this movie. I love the drama! like foreign movies and this one sounds like a good escape! I loved my VHS copy of "Enchanted April", but no longer have a player. I'd love to have it on DVD. Thanks for the giveaway! I would love to win. This has excellent reviews and looks great. I have heard so many wonderful things about this movie-please enter me to win1 Thank you! My daughters and I love British dramas. I'd love to win so that we could watch it together. Thanks for the review and giveaway! Alfred Molina is a terrific actor. It would be great to see him in this film. Thank you for the chance to win. Joan Plowright is reason enough to see this movie. Josie Lawrence looks like she would fit the role perfectly. I'd love to see this movie. Thank you! Because I love to watch new movies. I want to see it because on Amazon it has a five star rating and stars Miranda Richardson. I think this movie looks good because it reminds me of Masterpiece Theater productions...which I love. I enjoyed the book, and I'd love to see how Miranda Richardson and Joan Plowright interpret the characters. I am enchanted with your review, by the way. I've been in situations where I can feel my hair growing, and it's not good. Kudos to you, though, for finishing it. It sounds like a very interesting film! Thanks for the chance to win! I like to see these period classics. Always like the costumes. I like period dramas and any movie with historical value. I did see the movie once many hyears ago and absolutely loved it. I would love to see it again at this stage of my life. Subscriber of Seven Dogs and a Baby via email. I've actually been meaning to see this movie! It looks like the scenery would be fantastic, and I've heard great things. Thanks for the giveaway! This sounds really good. I love movies where unlikely people come together and form something magical. In this case a friendship. Thanks! Well I've already seen the movie so I know I'll like it. Mrs. Olivier is always wonderful - and under-appreciated. Enchanted April looks like a great movie, I would love to see it. I love british Drama thats why i want you to count me in on the giveaway! I'd like to win this because I've heard rave reviews of it in the past but I've never seen it. Sounds like a wonderful movie to own! I'd love to win a copy of this DVD for my mom -- it's one of her favorite films, and I don't believe she owns this collector's edition of it. I haven't seen it myself, but I'd definitely enjoy watching it with her - I'm a big fan of Miranda Richardson, and I'd watch her in just about anything! I'm a fan of British dramas. I liked the book and enjoy English period pieces...so I'm curious. I love British dramas, as long as they are set in an older time period. I enjoy seeing the costumes and observing the mannerisms and speech of a different time. I think Enchanted April would please me. I like the english genre for movies,loooks good! Now following on twitter and tweeted! I really like British movies and want this a lot! had goodreviews in imdb ty. I made friends with a psychic when I was a newspaper reporter 13 years ago. She wanted me to see Enchanted April with her, and on a rainy April day we popped in the video and began to watch, but 15 minutes into the movie there was a power outage that lasted for hours. So, I've still never seen the movie. Since my birthday is in April, I think there is all the more reason to award the DVD to me. Thanks. I just love these British films with a bit of history, romance, and drama all in one. The cast is excellent, and I must say, I've been following Alfred Molina's career ever since "Raiders of the Lost Ark." If you like his work, check out "Letters from Brezhnev, a very touching drama that was one of the first times I remember him getting a lot of attention for his work. My book club read the book and it was great! I'd love to own the movie. I would like to see the movie because it looks very interesting! i grew up on english movies and it seems like a take off of the old movie with women staying at a villa over the summer (i think there was a Redgrave in it?). so i'd like to see it to compare them!